We had just wrapped up several days with a team of high school students and teachers from Hong Kong International School (HKIS), serving together at a small school and nearby church in rural Cambodia. This area in Kampong Thom province has been the site of CWEF clean water projects for several years. Our time together with the many kids at school and church had been hot, dusty, fun, challenging, and enlightening. We had been teaching, learning and exploring with the older kids in the area how they might use the gifts and talents God has given them to make positive changes in their own communities. We had been serving alongside local pastors and church members, praying before meals and sharing bibles stories and songs with the kids at the local church. At dinner on our last day in Kampong Thom, one of the HKIS students surprised me at dinner: “So…I hope it’s okay: I have a bunch of questions for you about Christianity.” She was sitting clear across the table from me, so that the other 5 or so students at the table were also forced to listen to our conversation. “Of course that’s okay,” I replied, saying a silent prayer for grace and courage. The first question was the best: “From your perspective, what is the core of Christianity?” Wow, what a great start and a great invitation to clearly share with these students the central Gospel truth of what Jesus has done for us and how it changes everything. She proceeded to ask me a series of more difficult questions about ‘hot-button’ issues: the relationship between science and faith, what the Bible says about homosexuality, heaven and hell, etc. I did my best to answer with grace and truth, and to make sure to always point back to the most important thing, which of course is not a thing or a concept or a doctrine at all but a Person. The One we remember and celebrate with special gratitude this week – God himself come to live with us, to die for us, to raise us and all Creation to new life with Him. In my (Josh’s) role as director for CWEF, a current major focus of my work is to build up a stronger base of donors to provide financial support and stability for the mission we have been called to, and for specific CWEF health and education projects. This spring and summer, I will be working hard to develop new contacts and relationships in Hong Kong and the U.S. for this purpose. Related to this crucial fund development work, we have been putting a lot of work recently into preparing to launch a new web site for CWEF, which I look forward to sharing with you very soon! In addition to the aforementioned service learning trip in Cambodia, I also had the privilege of joining another service team recently, this time with students and parents from Concordia International School Shanghai. We served together at a new clean water project site in China’s remote Yunnan province. Our main focus was to visit many of the 40+ families in the village and collect data and stories as part of a baseline survey for this new project site. In the next few months, we are preparing for several additional service learning trips in China, as well recruiting and managing interns in Hong Kong and Shanghai this summer. John (now 4!) 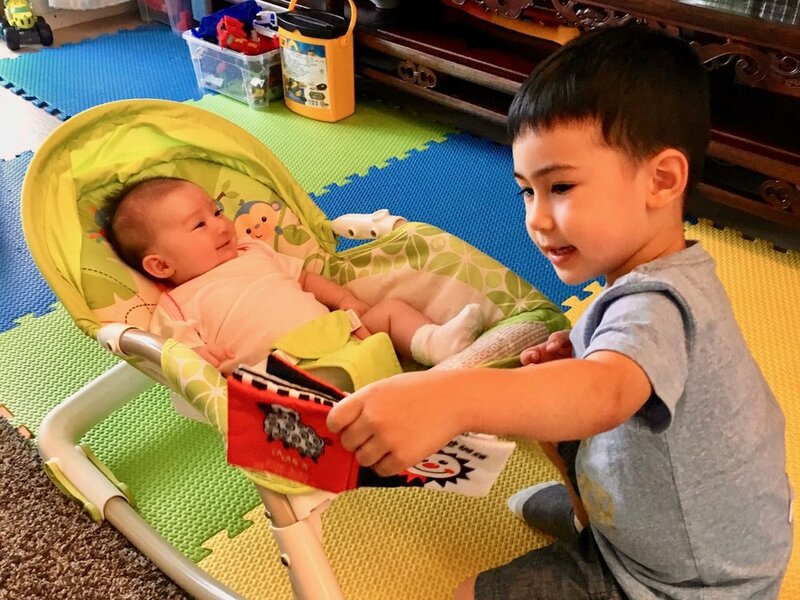 thoroughly enjoys his classmates and teachers at Concordia here in Shanghai, and he has a great time helping his little sister develop his love of cars and all things fun. Sophie (10 months) is now mobile – she started ‘scooting’ this month. For the many international school students who join CWEF service learning teams each year; that they would seek and find Jesus as a result. For all of CWEF’s health and education work planned for 2019 in Asia, that God would use our service for his good purposes. For God’s provision of funding for all of CWEF’s planned programs and operations support. For CWEF’s board of directors – for wisdom and vision as they make decisions about the future direction of the organization. For all the people connected to our family and the work of CWEF, that the Spirit would be working in their lives. Posted in Newsletter and tagged with newsletter. April 19, 2019 by Joshua Lange. Advent Greetings to you and yours! We pray you are doing well in the Lord. In our corner of the world, life has certainly felt abundant these past few months. Actually, it often feels a little too abundant. Does that sound familiar to anyone else…? As our inboxes, schedules and shopping carts overflow, we pray that God’s Spirit helps us to resist the world’s tendency to pull us around in every direction. May we instead be grounded in the Greatest Gift: our Good Shepherd, who came to lay down his life for you and me. Centered on him and his perfect birth, life, death and resurrection, we can “take hold of that which is truly life” (1 Tim. 6:19). That is good news worth celebrating. More good news worth celebrating: Coco and I had the joy of welcoming two people we love into God’s Family recently through the “washing of rebirth and renewal by the Holy Spirit” (Titus 3:5). The first was Mona, whose family lived one building over from us at our previous apartment complex and became one of Coco’s closest friends over the past few years. We thank God for his perfect design in bringing Mona and her family into our lives for friendship and encouragement, as we have been growing together in our marriages and in raising young kids. Mona was also there for our family in a big way when Coco was going through her recent bout of hospitalizations and surgeries right after Sophie was born. And in the midst of all of this life together, the Spirit was working in Mona’s life as she got to know Jesus and was introduced to a great local church family, who have welcomed her and have lovingly walked with her through the first steps of her journey of trust in Him. The second person we dearly love whom we now also call a sister in Christ is our baby girl, Sophie. We were so grateful to be surrounded by friends and colleagues from Concordia International School Shanghai (where John is now also attending preschool), as we welcomed Sophie into God’s Family. We recently welcomed Panhary to our team in Cambodia, who is doing great work with our education programs there, one being scholarships for university students. 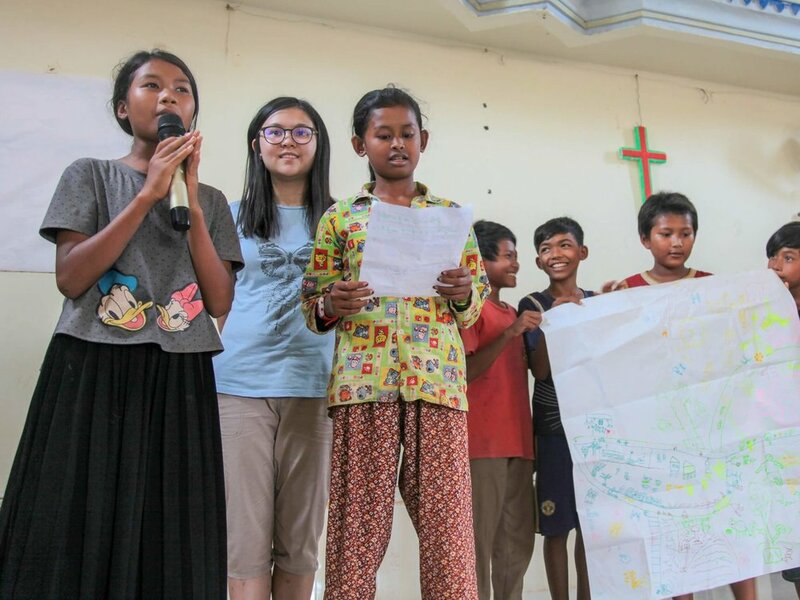 The young people we support through the University Scholarship program come from various connections within the Cambodia Lutheran Church community, and from ­a local partner home for orphaned or abandoned children called Child Rescue. In October, we were thankful to be able to partner with Child Rescue and another local non-profit called Stronghold Cambodia to carry out a ‘Teen Health Retreat’ led by two Cambodian pastors – Jesse and Joseph – which was focused on God’s good design for relationships. Several Drinking Water and HEAL projects (with a focus on health education) are ongoing in China’s Yunnan province. These projects are led by CWEF’s Jenny Chu and are focused on bringing renewal of bodily health to children and families in five communities, impacting over 800 people. Soon, Jenny will begin working to develop relationships and HEAL projects at a new project site near her hometown in northwestern Yunnan province, which is very close to the border with Tibet and Myanmar. Working with churches, schools, partner non-profits and other groups, CWEF has more than ten Service Learning experiences planned for the coming year, which will provide support for CWEF health and education programs. Many people continue to ask about Coco’s health and ongoing road to recovery these past few months. Deep thanks to everyone who continues to pray and show concern for her. We are very happy to report that she is now nearly back to 100% physical health. Which is great timing, because now Sophie’s sleep is starting to get less and less peaceful, so we all need to be at full strength! For Mona and her family – Gary, Mia and Gabe. For Sophie, as she grows into the person God has made her to be. For Coco, as she continues to recover and gain strength for her service to our family and community. For all of the health, education and service learning work planned for 2019 in Asia, that God would use our service for his good purposes. As the year comes to an end, please pray about and consider a special year-end gift to support us as we serve God’s people in Asia. We thank God for your faithful prayer and financial support through the years. We have been so blessed by you and the many supporters who stand with us in the work God has called us to. December 17, 2018 by Joshua Lange. There has been much exciting activity at the beginning of the school year here as Concordia Shanghai is celebrating its 20th anniversary. It has been one of the great privileges of my life to learn with, be encouraged by, and to contribute to this community of learning and service through my work with CWEF, a long-time strategic partner of Concordia Shanghai. We are excited to see what God has planned for the next 20 years at His “miracle school” in Shanghai. With the start of the school year, I have also been blessed to reconnect with several teachers at Concordia Shanghai who joined members of Christ Lutheran – Costa Mesa, CA for a CWEF service trip in mid-May to one of our HEAL health education project sites in China’s Yunnan province. We were very blessed on this trip to be able to make great God-ordained connections with several members of the local community. One such connection was with Mrs. Yang, a delightful and cheerful older woman who I first met one morning as I was heading from the church building where we were sleeping to the latrine building down the hill. I ran into LeeAnne, one of the team members, who said: “Hey! Could you help translate so I can talk with this woman I just met?” With some difficulty, I was able to translate for LeeAnne and communicate just enough to make a good connection with Mrs. Yang. It was Sunday morning, so as we were parting ways I took the chance to say: “Will you join us at the church this afternoon?” Mrs. Yang replied: “Is that okay? I’m a Buddhist.” “Of course!” I said. “Everyone is always welcome.” Later that day, we were all thrilled to see Mrs. Yang as she ambled up the hill in her nicest clothes to sit with us at the foot of the stairs and tell stories, and then eventually as the service began to head into the sanctuary with the small contingent of local Christians, who welcomed her with open arms and sat beside her in the front pew, as the preacher stayed perfectly to the basics and spoke from John 3:16. We are amazed to see how God continues to use the service of our CWEF team members, volunteers and partner organizations to bless people and make Himself known in powerful and often unexpected ways. It’s fun to play a part in what He is doing in this part of the world, and we are grateful for the opportunity. I am writing this letter from Hong Kong, where we had our quarterly CWEF board meeting yesterday evening. Later today, I leave for southern China to take part in our annual CWEF Team Retreat. Our entire team from all 4 offices in China and Cambodia will gather together for a time of planning, team-building, mutual encouragement, prayer and worship that strengthens all of us for our work in the year ahead. Following the team retreat, we will be going full steam ahead with the beginning of the school year, which means many of our education programs will resume, in addition to our annual collaboration with Concordia Shanghai – the TrIBES service learning trips, one of which I will be helping to lead in rural Yunnan province. Thank you once again to everyone who offered prayers and notes of encouragement during Coco’s recent bout of hospitalizations and surgeries after Sophie’s birth in June. Words cannot express how thankful we are to God for providing mercy and healing for Coco, and to all of you for your faithful love and support during a difficult few weeks. Among other things, this experience has impressed upon us the power and importance of prayer in our lives, and the true beauty of the Body of Christ as it cares for those in need. It has now been a full month since Coco’s release from the hospital after the last surgery, and she is getting stronger and stronger each day. Her need for pain medicine is finally starting to diminish, but she is still not able to pick up Sophie for at least a little while longer, so we continue to be grateful for her mom's presence and loving help. Sophie is doing quite excellent as she has been since entering the world. At times, she is now able to sleep for 4+ hour stretches at night and has begun to smile and 'talk' with us. We are definitely having fun with her and are so thankful. 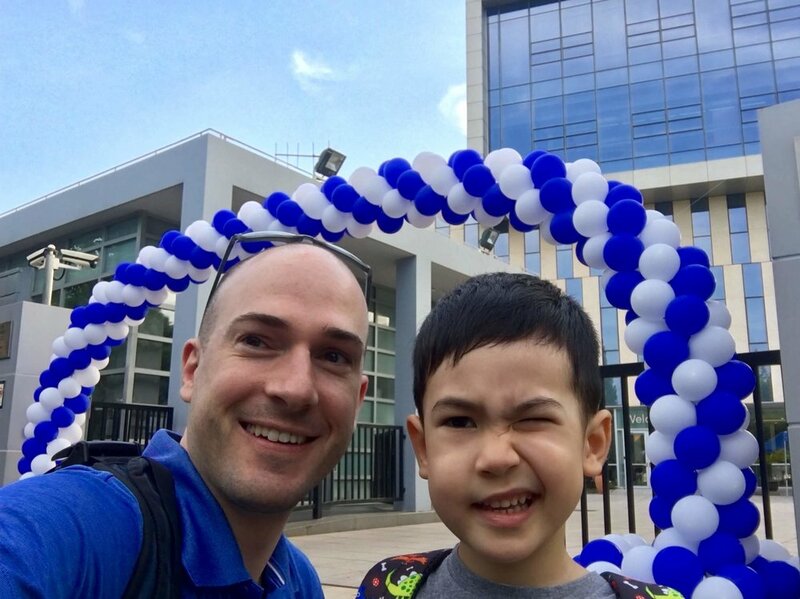 Last week John started preschool at Concordia Shanghai and he LOVES his school and new teacher. She and her husband are new to Shanghai this year, most recently at a Lutheran school in the Houston area. With John going to school on the opposite side of the city from our previous home, we had to make a move to a new apartment, which we just completed over the last several days. The timing of this was a little tough, as I had to leave for this current work trip the day after the movers did their thing. Please join me in praying for Coco and the kids as I am away for about a week and the new apartment is still in need of a lot of work. For our family, especially Coco, John, Sophie and 婆婆 (Coco’s mom) as I am traveling for work, as we all adjust to life in our new apartment and neighborhood, and as Coco continues the long and slow recovery process. Thanksgiving for the wonderful May service trip in partnership with Christ – Costa Mesa and Concordia Shanghai. Ask that God would use the relationships and connections made during the trip to advance His work. For Mrs. Yang and Mr. Li, that the Spirit would be working in their lives. For our upcoming CWEF team retreat this week. For the TrIBES service learning trips at the end of September. God’s provision of funding for all of CWEF’s planned programs and administration support. August 28, 2018 by Joshua Lange. So much has happened since the last time we shared an update with you, and through all of it we have been reminded of God’s perfect timing and arrangement of people and circumstances for his good purposes. Kanhchana, our health director in Cambodia, has begun training second-year HEAL program advocates using lessons from CHE (Community Health Evangelism). Several of the advocates who were given the gift of faith through their participation in the program last year are now intentionally bringing their husbands or other family members to training so they can hear the Gospel along with the practical and valuable health training. Melody, a CWEF university intern and previous high school scholarship recipient, has received the gift of faith and is preparing for baptism. We had the opportunity to host Summer, another university intern and previous high school scholarship recipient, here in Shanghai earlier this month. She was invited to tell her story at the annual fundraising auction for Concordia International School Shanghai. The Spirit is working in Summer’s life through his Word and through friends, and she was able to join us for worship service during her visit with us. In our last letter we shared that Persephone, previous CWEF executive director and my (Josh’s) supervisor, had stepped down and was planning to return to the U.S. in January to care for her ailing father. As it turned out, she had to leave in early November, as her father unexpectedly was injured in a bad auto accident (from which he thankfully has recovered quite well), and in early December I took over the role of interim executive director for CWEF. This was a bit of a shock that I wasn’t quite prepared for, since I was also pushing hard to finish the final project of my master’s degree before the end of the year. Due to all this, the last two months of 2016 was an intense period of long hours, little sleep and – let’s be honest – a lot of stress. By God’s grace, Coco and I will also remember this time period as one in which the Lord covered us with his abundant love and peace through many answered prayers, unexpected supporters, perfectly timed encounters with good friends and his ever-sustaining Word. We sincerely appreciate all of you who regularly pray for our family. In January, we enjoyed the gift of spending time with our colleagues for an LCMS family retreat and CWEF annual meetings. All the members of the LCMS Asia team and our families met together in southern Taiwan during the first week of January for worship, fellowship, learning and fun. Our little John enjoyed celebrating his 2nd birthday and having fun with a LOT of new friends in Taiwan. Two weeks later, Josh traveled to Phnom Penh and Kunming for program planning meetings with the CWEF Cambodia and China teams. During these meetings, we were blessed to be joined by Julie Lutz, the newest member of our CWEF team and one of the people God brought to help out at just the right time. Julie has been serving with LCMS in Papua New Guinea for nearly 30 years, but due to some visa issues, she isn’t currently able to return to PNG, so she has agreed to come serve with CWEF in a temporary role supporting our local staff, and is working out of our office in Hong Kong. Thank God for Julie! In the past two months, our team in China has been focused on adjusting to new laws that have come into effect in China regulating international non-profits with operations in mainland China. The primary change is that we need to re-register our offices through the public security bureau (the police). We are currently in the middle of this quite lengthy process and would very much appreciate your prayers: that we could complete the process as quickly as possible, that we would be allowed to continue operating as we have been and even that God would open up new opportunities as a result of this re-registration process. Meanwhile in Cambodia, our health and education programs continue to move forward, and at the beginning of April I will be making a trip there to spend time with our team in Phnom Penh together with LCMS colleague Rev. Charles Ferry. Pr. Ferry is based in Indonesia and is responsible for the Southeast Asia area, including Cambodia. He has recently been added as a member of CWEF’s board of directors, and I’ll have the opportunity to introduce him to our programs and partners there, including members of the burgeoning Cambodia Lutheran Church. 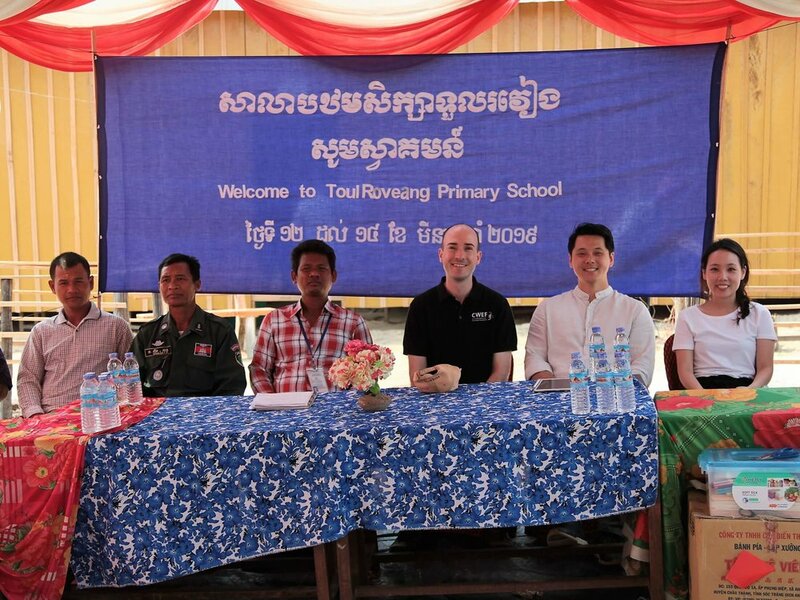 In early March, our Cambodia staff worked with a service team from Hong Kong International School, who supported one of our bio-sand water filter projects there. In family news, John has started attending ‘school’ – a small daycare in our neighborhood. He is loving it, and so is Coco, as she now has some very welcome free time during the week. She and I have begun getting more engaged in our church here in Shanghai – Coco’s now singing with the music team and I’ve started teaching Sunday School – 6-8 year-olds (!). It has been a fun and meaningful addition to our lives these past few months. For CWEF’s board of directors and regional LCMS leadership – wisdom as they seek out a new permanent executive director for CWEF and potentially other positions as well. For LCMS International leadership – as they seek to fill open roles in the Asia region, particularly: regional director and regional business manager. For CWEF’s organization re-registration process in China. For Julie, as she continues to adjust to life in Hong Kong and work with CWEF. Continued prayers for Persephone as she adjusts to life back in the U.S.
March 21, 2017 by Joshua Lange. Paul’s “prayer for spiritual strength” for the Christians in Ephesus was the theme for the recent ALEA (Asia Lutheran Education Association) conference, which I had the privilege of attending last month. Over a hundred educators, administrators, ministry leaders and non-profit workers assembled together in Hanoi, Vietnam in mid-September to share ideas and encourage each other in the work we have been called to. I was also invited to help lead one of the workshop sessions, together with my colleagues Persephone James and Beka House from CWEF and Concordia International School Shanghai. Just before the conference began, we were also able to celebrate and thank God with everyone at Concordia International School Hanoi, as its beautiful new campus was dedicated. I reflected back to the last time I had been in Vietnam – over 8 years ago, just a few weeks after I had arrived in Hong Kong to begin my service with LCMS. An international school in Hanoi was still just an idea at that point. What a joy to see what He has done and is doing in that place! returning to China and trying to catch up on many things after summer travels in the U.S.
preparing for and helping to lead our annual collaboration with Concordia International School Shanghai – TrIBES service trips at the end of September with CISS high school students and teachers, this year to two of our project sites in Yunnan and Guangdong province, China. And in the middle of all of that we also received the news from Persephone James, CWEF’s executive director, that she will be stepping down in late January and will be repatriating to the U.S. to care for her ailing father. We affirm that this is the right decision for her and her family, and we also wish she could stay! Persephone has been a great leader for us in her brief time with CWEF and has been an awesome supporter and encourager for me personally and in my work. We'll miss her dearly. For Persephone – thanksgiving that God allowed her to serve with us during this season, and blessings and protection as she prepares to complete her service in Asia and to continue her service in the U.S. with her dad and family. For CWEF’s board of directors and regional LCMS leadership – wisdom as they seek out a new executive director for CWEF. For everyone at Concordia International School Hanoi – thanksgiving for their new campus and blessing as they carry out His mission. For Coco’s dad – protection and good recovery from surgery. For me – spiritual strength, good health and protection as I help lead CWEF through more transition. October 10, 2016 by Joshua Lange.